Acting on a tip-off a joint team of forest and police personnel led by the beat officer of Mangaldai (Territory) under NK Forest Division, Jatin Bora on Monday, conducted a raid in Bhakatpara Kacharigaon village under Dhula Police Station of Darrang district where they busted an illegal sawmill reportedly running for quite a few days in connivance with a section of corrupt police and forest officials. The joint team seized the set of the mechanized saw and power generator worth around Rs 1 lakh. However, the owner of the illegal sawmill managed to escape before the arrival of the team. 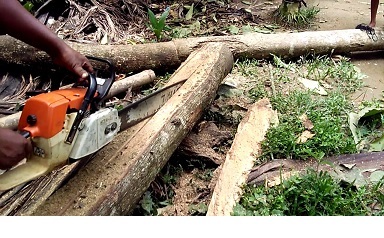 It may be mentioned that in a joint operation launched by the Forest Division of Dhubri and Parbotjhora Divisions on April 2, 2018 seized equipment and timber logs from four illegal sawmills operating in Bhelkhowa and Boraibari area under Parbotjhora Forest Division in the Bodoland Territorial Areas District (BTAD). All four sawmills which were being operated in the areas illegally were dismantled by the field staff members of duo forest divisions, informed by the official of Parbotjhora Forest Division. The official said that these sawmills were functioning illegally in violation of sawmills rules. Soon after coming to know about the operation, all the working staff members engaged in the mill managed to flee from the spot while the parts of sawmill like wheel, motor, saw band and timber worth Rs 10 lakh were seized by the forest team. While contacted, A Sundar, District Forest Officer of Parbatjhora Forest Division said that a joint team from Parbatjhora and Dhubri launched a drive against the illegal sawmill operated in the locality and seized the woods worth Rs 10 lakh and also machines used in the site.